Baked chickpeas is a crisp snack with, where canned chickpeas are baked with spices to give it the crunch and the feisty taste. Rinse and strain the chickpeas thoroughly. Drizzle oil on chickpeas along with salt and pepper. Spread it on a baking tray in single layer and bake it at 450 degrees Fahrenheit for about 25 minutes till they are crisp. While chickpeas are baking, chop tomato, onion, green chillies and fresh cilantro finely. 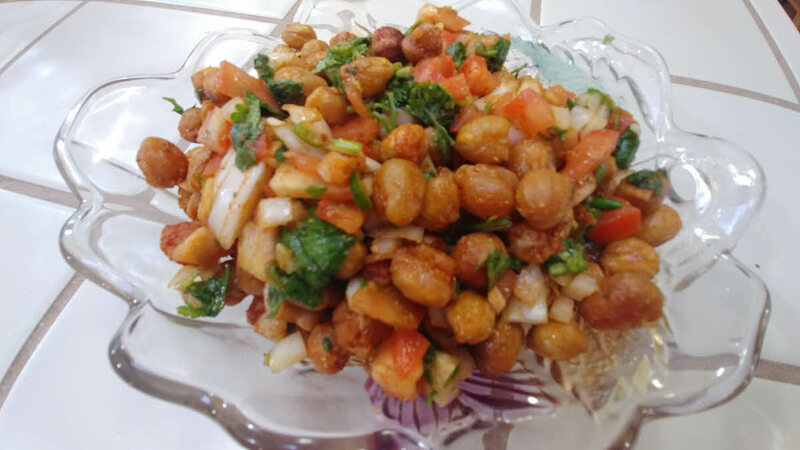 Once the chickpeas are done, take them out and toss them with chopped tomatoes, onions, green chillies and cilantro. Sprinkle the chaat masala on top and squeeze a lime and toss again. Adjust the seasonings as per your taste. Baked chickpeas are ready to serve. If you wish you can add some chilli powder to it.